The cost of living in Brussels is relatively higher compared to most European cities, but Belgium's sterling economy ultimately evens things out for working expats and citizens. When renting a house, condominium, apartment or flat in Brussels, the costs depend on a case-to-case basis. A rent guarantee may be collected by the landlord but is not mandatory. Also, a tenant is obligated to pay such a guarantee only when it is stipulated in the contract. A typical house costs about €169,972 on average and a villa, about €313,860. As long as necessary requirements are in place, expats are allowed to buy properties in Brussels such as apartments, priced about €172,801 each on average. It is recommended to buy small apartments which are generally more practical and decently comfortable alternatives at €600 monthly. Other expenses to consider include rental costs, with monthly rent for a 1 bedroom flat with an attached bathroom costing €200 to €750. For a 2-bedroom fully furnished flat, expect rent to cost €1295 to €1681 while monthly rent for a 3-bedroom fully furnished flat will cost €1100 to €4650. 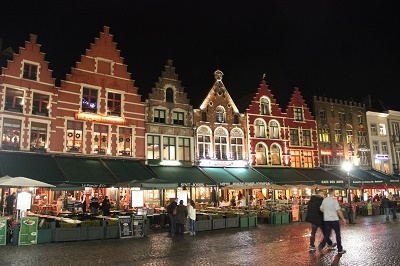 Foreign nationals are allowed to purchase property in Belgium, so Brussels-based expats have no problem finding good investments for their hard-earned keep. Apartment costs can range from 2,500 to 5,000 Euros per square meter depending on location and condition. A typical family home may be more expensive at 3,000 to 4,500 Euros per square meter while a property with picturesque views may cost up to 4,250 Euros per square meter. It is normal to pay 5-10% as a deposit, but the amount is blocked by the notaries and not given to the agent until a notarized deed of sale is signed. Special regulations apply to apartments and houses that are still being built in order to protect the buyer during the processing. Also, the official deed of sale must be signed by the parties and the notary within three to four months after the purchase agreement. An average family in Brussels lives on €2,293 a month including household utilities, with costs divided into electricity, water, cable and Internet. Expats who are planning to relocate to Brussels will find that it will cost €35 to €40 to receive a monthly internet connection. In general, expatriates living in Brussels will spend about €212 a month for home-cooked meals, including drinks and cigarettes. Hotel and restaurant food expenses, on average, could amount to €58.33 a month per individual, and could include sophisticated meals of grilled beef with rosemary on a roquette and parmesan salad. Vegetarian options range from five vegetables served with salad and vinaigrette to pasta dishes costing only about €20 to €35. With €60 to €100, one can enjoy the luxurious broccoli terrine with wild asparagus or lobster with turmeric and coconut milk. Other food-related expenses to take note of include €14 for one daily menu in the business district and €65 for a dinner for two in an Italian restaurant with wine and dessert. A cheaper alternative to eating out can be found in McDonalds, where 1 Big Mac Meal will cost €7 to €10. Transportation in Brussels includes mostly taxis and metro lines under the management of the Societe des transports Intercommunaux Bruxellois. Tickets may be purchased at any metro ticket stations where fares range from €1.70- 2.00/person for a single trip, €7.30 for five trips and €12.30 ten trips. The airport line one-way ticket costs €3.00 while a single one-day card allows a passenger to use any STIB vehicle for one whole day at a cost of € 4.50 while a group one-day card allows a maximum of 5 persons for €10. One inner city bus ticket will cost €2 to €2.20, while a monthly ticket for public transportation will cost about €48. Expats who prefer to use the taxi will find that the price per kilometre is €1.23 or €2.46 depending on whether the journey is in or out the nineteen districts of Brussels. The fixed charge at night is €4.40 while the waiting charge is €23.00 per hour. Those who are bringing in their automobiles from overseas will have to take note that 1 litre (1/4 gallon) of gas will cost €1.20 to €1.50. In Brussels, it may take a little bit more to experience occasional luxuries, but nevertheless, living wages are well aligned with the city's high cost of living. Other costs that expats may take advantage of include entertainment expenses, where it will cost €19 for 2 tickets to the movies and €52 for 2 tickets to the theater.